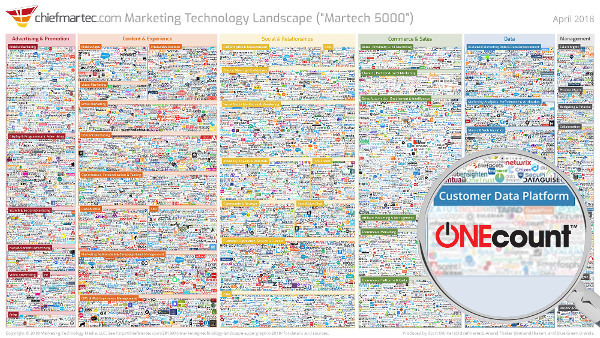 Over the past 6 years the number of marketing technology solutions has rapidly increased every year from a measly 500 solutions to nearly 6,000 solutions today. Each of these solutions are used by websites for a variety of purposes including: ad network capabilities, e-mail marketing, customer service apps, data & analytics and social media marketing. ChiefMarTec.com updated their infographic last month which tracks the number of solutions by category. ONEcount is pleased to be represented in the MarTec LUMAscape in the CDP category. Our comprehensive Audience Activation Platform combines CDP, DMP, and CMP functionality in a single, highly-integrated platform. A commonality shared by most of vendors is the promised benefit of solving a problem that will help their clients drive revenue. But, that might not always be the case. Many marketing technologies focus on serving one category of marketing solutions (such as: single- and social-sign-on, advertising targeting, or e-mail marketing). Various vendor’s specialties led organizations to select multiple vendors to meet digital strategy needs. According to a recent article in Publishing Executive, some websites use around 75 different solutions on a single website. Even using just a few marketing technology vendors can cause problems. Fortunately, ONEcount can simplify these complex implementations. ONEcount has over 20 years of experience working with publishers and media companies, specifically providing aid in the digital space. ONEcount’s comprehensive solution is truly an all-in-one solution that bundles capabilities most commonly used by publishers and media companies. All of the solution’s features are included for a single low monthly cost, rather than priced a-la-carte. This experience greatly drove the platform’s development to complement the needs of publishers and marketers within the publishing industry. Organizations using multiple third-party add-ons to execute their digital strategy are estimated to spend nearly $17K to $30K per month to execute the same efforts that could be done at a huge savings using ONEcount. The European Union’s (EU) privacy regulation, GDPR, going into effect on May 25th means that publishers with audiences who reside in the EU will be required to make sure their vendor’s software is GDPR compliant. Failure to comply with GDPR regulations puts organizations at risk for legal issues and fines. Allowing multiple solutions access to customer data increases the chance of a data breach. A core component of ONEcount is the Customer Data Platform (CDP) capability. Customer data is consolidated from multiple data silos, like CRM databases and e-mail service providers (ESPs), into a single platform. This enhances all users GDPR compliance by allowing organizations to seamlessly manage customer profile data in one single platform. As well, customers are able to securely review, modify or delete their data in a unified preference center—all important requirements of several GDPR articles. ONEcount is the only customer data platform (CDP) that couples DMP capabilities, along with a host of other tools that would otherwise require multiple third-party vendors to enhance user experience and optimize marketing strategies. To find out how ONEcount can help you turn your audience identity into extra cash for your bottom line, contact Elaine Goncalves, Account Executive at 203.665.6211, x219 or elaine@one-count.com or Joanne Persico, President at joanne@one-count.com or call 203.665.6211 x204. This entry was posted in Smart Briefs and tagged marketing tools, marketing vendors, martech, optimization, smart brief. Bookmark the permalink.